1st Battalion, 23rd Marines (1/23) is one of 32 infantry battalions in the United States Marine Corps, and one of only eight battalions found in the reserve. It is located throughout Texas and Louisiana consisting of approximately 1000 Marines and Sailors. They fall under the command of the 23rd Marine Regiment and the 4th Marine Division. The battalion was activated on November 20, 1942, at Marine Corps Base Camp Pendleton, California. The Battalion's next action came at the Battle of Saipan which began on 15 June 1944. Their transport there was APA 35 the USS Calloway. Saipan was the linchpin in the Japanese defense of the Central Pacific. To make an amphibious assault even more difficult, it had several towns and a civilian population of about 20,000. Using the lessons learned at Roi-Namur, intensive pre-invasion naval bombardments and air strikes on Japanese positions began on 11 June 1944. Marines came ashore and were immediately met with intense and accurate fire from Japanese mortars, howitzers and antiboat guns. By 17 June 1944 a beachhead had been secured and on 18 June the Marines captured Aslito Airfield cutting Japanese defenses in two. The forces had to fight back a fierce Japanese counterattack in the form of banzai charges. For Siapan the 23rd landed on beaches blue 1 & 2. Shore party for 1/23 was the third battalion 20th Marines which was the 121st Seabees. The 4th Marine Division completed mopping up on Saipan on 16 July 1944 leaving only a week for preparation for the invasion of Tinian. The final combat action for 1/23 would come during the Battle of Iwo Jima. Iwo Jima was only 750 miles from Tokyo and was a major objective on the way to the Japanese mainland. The Japanese were painfully aware of the strategic importance of Iwo Jima and had prepared extensive and formidable defenses with a network of miles of underground caves and tunnels. The tunnels were in the islands black volcanic rocky base well protected from preinvasion naval and air bombardment. 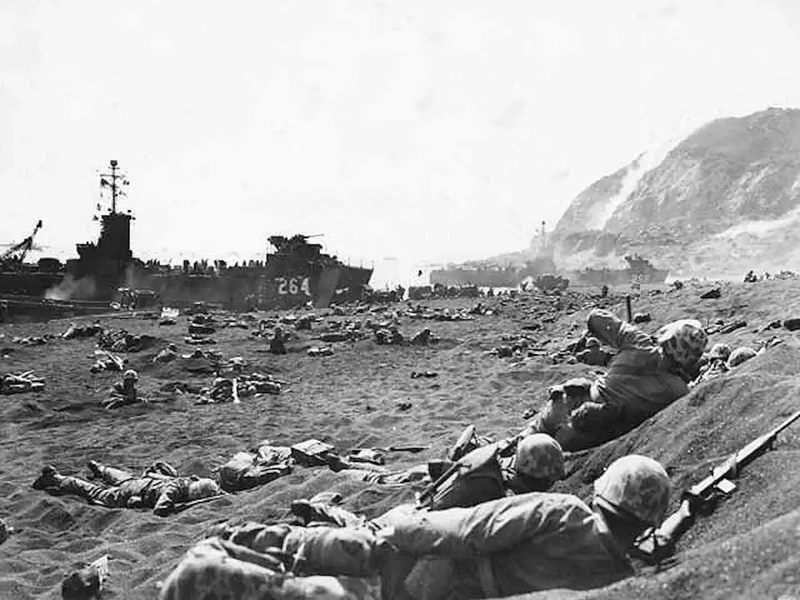 The 4th Marine Division landed in the first assault wave on 19 February 1945 . The 23rd and 24th Marine Regiments led the division’s assault with 1/23 being the left Assault Battalion on yellow beach 1. They landed from APA 158 the USS Newberry. The 23rd Marines were ordered to seize the Motoyama Airfield #1 for the 133rd Seabees to get operational. High seas, heavy surf and loose volcanic soil made movement off the beaches difficult. By 20 February 1945, 23rd Marines had made good progress towards capturing the airfield. With the exception of a few remaining small pockets of resistance, the division had defeated the resolute and entrenched enemy in its zone of action in twenty days at a cost of nearly 50 percent combat efficiency. The 23rd did not have a Pioneer Battalion for the assault so the Seabees of the 133rd Naval Construction Battalion were posted TAD to the 23rd and assigned that job. A Co. 133 was Shore Party to 1/23 until relieved on D-plus 18 by the Army Garrison Shore Party. The battalion was mobilized for the first time since World War II in January 1991 in support of Operation Desert Shield. The unit was deployed to Marine Corps Base Camp Pendleton, California, in support of the 1st Marine Division during this time. Operation Iraqi Freedom (June 2004) The battalion was again mobilized in June 2004 to conduct three months of pre-deployment training at the Marine Corps Air Ground Combat Center Twentynine Palms, California, in preparation for their upcoming deployment in support of Operation Iraqi Freedom. The battalion arrived in Iraq, relieving 2nd Battalion, 7th Marines in late August 2004. They augmented the 7th Marine Regiment, helping to secure the area spanning the Hit-Haditha corridor, west of Ramadi, out to the Syrian border of the Al Anbar Province. Initial assignments for the battalion's companies in Iraq saw assignments in Ar-Rutbah, Al Asad Airbase and Hit. The battalion returned from Iraq in late March 2005, having been relieved by 3rd Battalion, 25th Marines. About 800 Marines and Navy Corpsmen departed in November 2010 for pre-deployment training at Camp Pendleton in California. The 1/23 Marines deployed in March 2011 in support of II Marine Expeditionary Force in southwestern Afghanistan. The battalion mobilized for about 400 days, with seven months spent in Afghanistan. Alpha Company supported Regimental Combat Team 8 in the upper Sangin Valley and then transitioned to its own battle space in and around Camp Delaram II in the northwest part of Helmand province. Alpha Company also led a mission that confiscated more than 150 tons of poppy seed, marking the largest drug seizure by NATO forces in Afghanistan. Bravo Company supported RCT-1 (Regimental Combat Team 1) in the southern portion of Helmand province. Charlie, Weapons and Headquarters and Service Company’s were employed in several endeavors. These companies ran the Combat Operations Center at the Camp Leatherneck, Bastion and Shorabak complex and partnered with other coalition forces to make vast improvements to the security of the area. The battalion officially handed responsibility over a wide variety of operations in Afghanistan to the Massachusetts-based 1st Battalion 25th Marines during a transfer of authority ceremony on September 13, 2011. Wikimedia Commons has media related to Category:1st Battalion 23rd Marines.